Alright peeps. Thanks for tuning in last night, I hope you enjoyed the show. 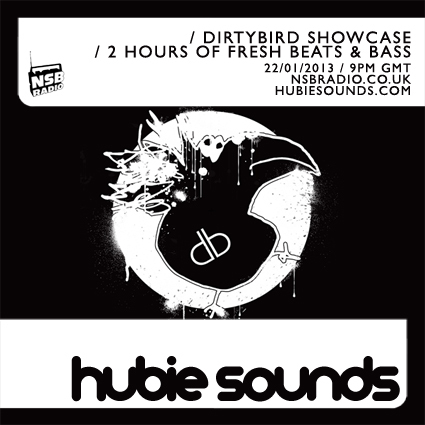 Catch the next Hubie Sounds on Tuesday 12th February @ 9pm GMT – live and direct on NSB Radio! Make sure you tune in to Hubie Sounds on NSB Radio this Tuesday night for a chance to win copies of Hybrid’s brand spanking new album Disappear Here – due for release on Distinctive Records on 29th March! Also up for grabs are limited edition Disappear Here tshirts! We’ll also be spinning plenty of fresh new tuna, including a showcase of Elite Force’s excellent new genre-bending album Revamped, plus much more! download the HUBIE SOUNDS xmas special! Hey peeps! Thanks for tuning in the other night, we hope you enjoyed the show. Thanks for downloading this show, we hope you enjoy it! Have a Happy Christmas and make sure you tune into the next Hubie Sounds in the new year. download HUBIE SOUNDS 002 on nsb radio! Hey everyone! Thanks for tuning in to the second Hubie Sounds on NSB Radio last night, we hope you enjoyed the show!